Elma, the backplane and base system specialist, is introducing new backplanes in 3U/6 slot and 6U/5 slot versions for the VPX standard, to meet the high demand for VITA 46/VPX-based solutions. Further versions are being developed, with at least two to be launched this year. High growth is anticipated for applications in the aerospace and defence markets, for example, areas, which the VPX – with its high shock and vibration resistance – is particularly directed at. Added to this, different cooling concepts (air flow, conduction cooled or liquid cooling) and interchangeability in the field through the use of special plug connectors offering a high level of protection, opens up a whole range of other fields of application. A further advantage of VPX is its possible upward compatibility to the VME bus, whose signals are connected through the VITA 46 connector. This helps achieve a simple migration between the VME bus and this new technology. Designed for maximum performance, the new backplanes comply with current VITA 46 specifications. Elma’s sound development and manufacturing experience in the field of high-tech solutions for fast backplanes has gone into the design. The results are optimal hardware quality, high long-term stability and signal integrity across all slots, confirmed in extensive tests. I/O support for handling large volumes of data – as required with digital video signals, for mass storage (SATA) and FPGA intelligence (Rocket I/O), for example – is integrated via the high-speed interfaces. Data rates up to 10 Gbps are possible via the serial switched fabrics. The 3U backplane supports 2 channels at the top of the J1 connector, as this is typical for Gigabit Ethernet traffic in big pipes (four bi-directional links). The remaining channels on J1 and others on J2 are reserved for 24 XAUI-compliant connections, which are fully usable for rear panel I/O functions. The remaining 24 channels for thin pipes (one or two bi-directional channels) can be used to accommodate PMC or XMC mezzanine cards. Alternatively, they can be used as interfaces, through which the VPX modules can communicate with external devices, networks, displays or memories. The 3U backplane also incorporates the Gigabit Ethernet control plane as per VITA 46.20. This sub-specification adds a GigE switch with separate star or dual-star network (out-of-band communication) and can be used for important supplementary functions such as system management, software and firmware upgrades and to initialise new processes on special boards. The 6U version has a 20-layer impedance-controlled layer stack-up. The five slots are connected together by a mesh topology, enabling a bandwidth of over 5,000MBps. 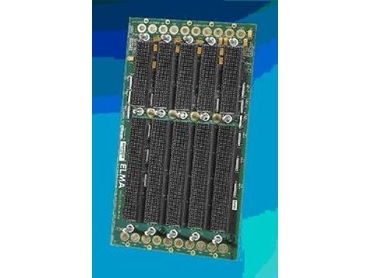 Elma’s 3U and 6U VPX backplanes are available from Dedicated Systems Australia .